Expedition 55's six-person crew—NASA astronauts Scott Tingle, Drew Feustel and Ricky Arnold; Russian cosmonauts Anton Shkaplerov and Oleg Artemyev; and Japan Aerospace Exploration Agency astronaut Norishige Kanai—was tasked with performing experiments studying Earth’s atmosphere and the effect of microgravity on bone marrow in addition to materials sciences and biological sciences. The increment also saw several visiting vehicle arrivals and performed two spacewalks. Upon the undocking of Soyuz MS-06 with its three-person crew at 23:08 UTC Feb. 27, 2018, Expedition 55 officially began. Taking over command of the new increment from Russian cosmonaut Alexander Misurkin was fellow cosmonaut Anton Shkaplerov. After nearly four weeks with a reduced crew compliment of three people, an additional trio launched to the ISS aboard Soyuz MS-08. The trio included Russian cosmonaut Oleg Artemyev and NASA astronauts Ricky Arnold and Drew Feustel. 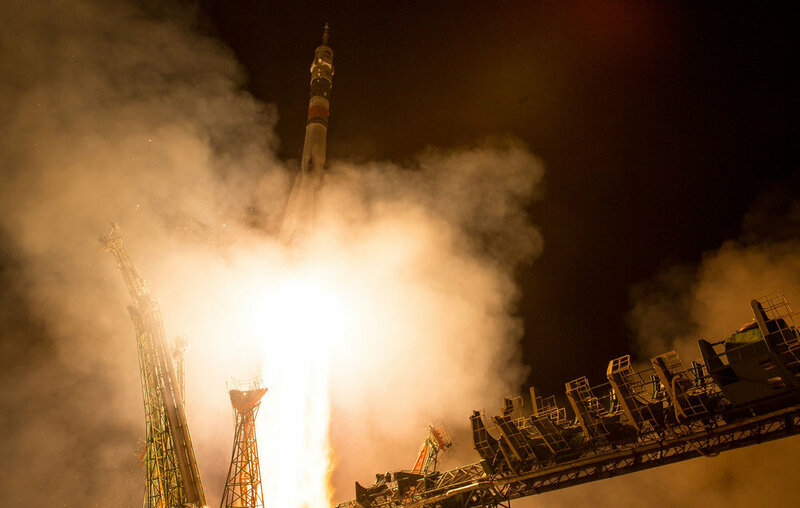 Liftoff atop a Soyuz-FG rocket occurred at 17:44 UTC March 21, 2018. After a two-day trek to the space station, the spacecraft docked with the Poisk module. Once aboard, the now six-person Expedition 55 crew made their way to the Zvezda module for a post-docking video conference with friends and family before Shkaplerov gave the new trio a safety briefing a tour of the outpost. 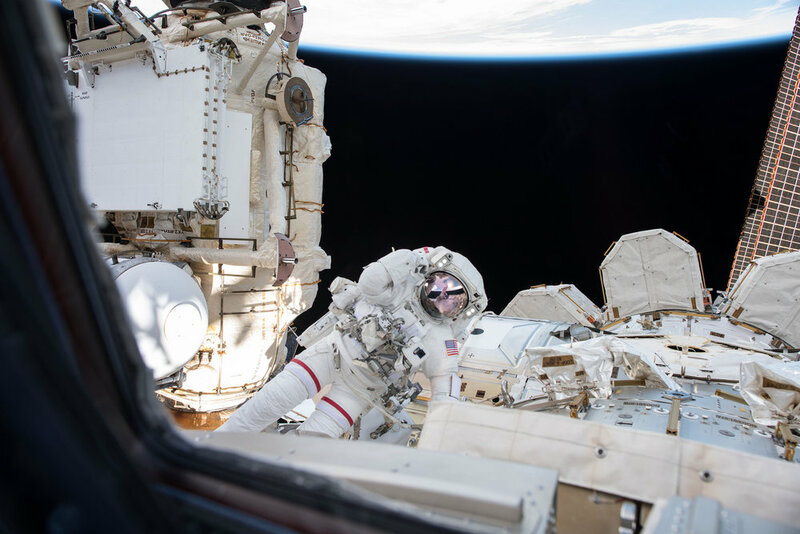 The new crew members didn't have long to settle in before two of them, Feustel and Arnold, were tasked with performing U.S. EVA-49, which involved installing wireless communications antennas and replacing a camera system on the port truss. After donning spacesuits, the outing officially started at 13:33 UTC March 29 and lasted a total of 6 hours, 10 minutes, wrapping up at 19:43 UTC. Because of a limited consumable in the duo's suit's carbon dioxide scrubbers, the spacewalk was limited to about six hours. However, the two were still able to complete all of the primary goals and complete get-ahead tasks. Wireless communications antennas were installed on the Tranquility module, several hoses were removed from the radiator system on the P1 truss segment and a Camera, Light, Pan/Tilt Assembly was replaced with a high-definition camera. Get-ahead tasks included breaking torque on bolts on a spare ammonia pump module for a future EVA. This was the 209th spacewalk in support of space station assembly, maintenance and upgrades, the first one occurring in 1998. It brought the spacewalk cumulative total to 54 days, 10 hours. At 20:30 UTC April 2, 2018, SpaceX launched its CRS-14 Dragon capsule atop the company's Falcon 9 rocket. This was the first cargo vehicle to visit Expedition 55 and it brought with it some 2,600 kilograms of food experiments and hardware, including several items in the spacecraft's unpressurized trunk. Two days after launching into space, Dragon arrived at the outpost. The station's robotic Canadarm2 was used to capture the freighter at 10:40 UTC April 4. Several hours later, it was berthed to the Earth-facing port of the Harmony module. This same capsule was used for the CRS-8 mission to the ISS in April 2016, which brought the Bigelow Aerospace Activity Module to the outpost. Dragon stated berthed for one month. During that time its cargo was unloaded and replaced with some 1,800 kilograms of equipment bound for return to Earth, including Robonaut2, a humanoid robot that was launched in 2011 aboard space shuttle Discovery during STS-133. While Robonaut2 had been in space for more than seven years and was even given a set of “legs,” complications with its hardware never allowed it to fully operate as designed. In fact, it has remained packed away for most of its stay aboard the outpost with astronauts occasionally attempting repairs. With an original return date set for May 2, high seas in the recovery area forced SpaceX and NASA to postpone the unberthing operations to May 5. Dragon was unberthed by Canadarm2 and released at 13:23 UTC. Several hours later, the capsule performed a parachute-assisted splashdown in the Pacific Ocean before being recovered. Two weeks later, on May 16, Feustel and Arnold ventured outside again to rearrange coolant pumps and continuing replacing cameras and antennas. U.S. EVA-50 started at 12:39 UTC and lasted about 6.5 hours. The spacewalking duo first worked to move two pump flow control subassembly, or PFCS, units. These devices are designed to drive and control the flow of ammonia coolant on the exterior of the ISS to regulate the temperature of the station’s power-generating equipment. A spare PFCS, named “Frosty” was located on External Stowage Platform 1, or ESP-1. Mission managers wanted to swap the locations of these two units so that the working device would be more accessible should it be needed. Once installed on Dextre, it was remotely moved into its final location by ground teams. After the PFCS task was completed, the two worked to replace another camera group, much like what was done on the previous extravehicular activity. A third task involved Feustel replacing a space-to-ground transmitter on the Z1 truss. When all the tasks were completed, including several small get-ahead tasks, the duo made their way back inside the Quest airlock, ending the spacewalk at 18:10 UTC. A week after the spacewalk, Orbital ATK (now Northrop Grumman) launched its OA-9 Cygnus cargo spacecraft to the ISS. Three days later, May 24, 2018, it rendezvous with the outpost. Capture took place at 09:26 UTC while the ISS was flying some 425 kilometers over the southern Indian Ocean. Cygnus brought some 3,400 kilograms of crew supplies, science experiments sand a number of CubeSats for future deployment. The spacecraft's mission, however, would continue through the end of Expedition 55 and into the beginning of Expedition 56, departing in mid-July 2018. Additionally, a test of the spacecraft's main engine's reboost capability was slated to occur in July, during Expedition 56. Once the mission of OA-9 Cygnus was completed, the cargo spacecraft was loaded with thousands of pounds of trash and other unneeded equipment. In mid-July, it was unberthed and released. It then performed a departure burn and slowly drift away from the ISS. 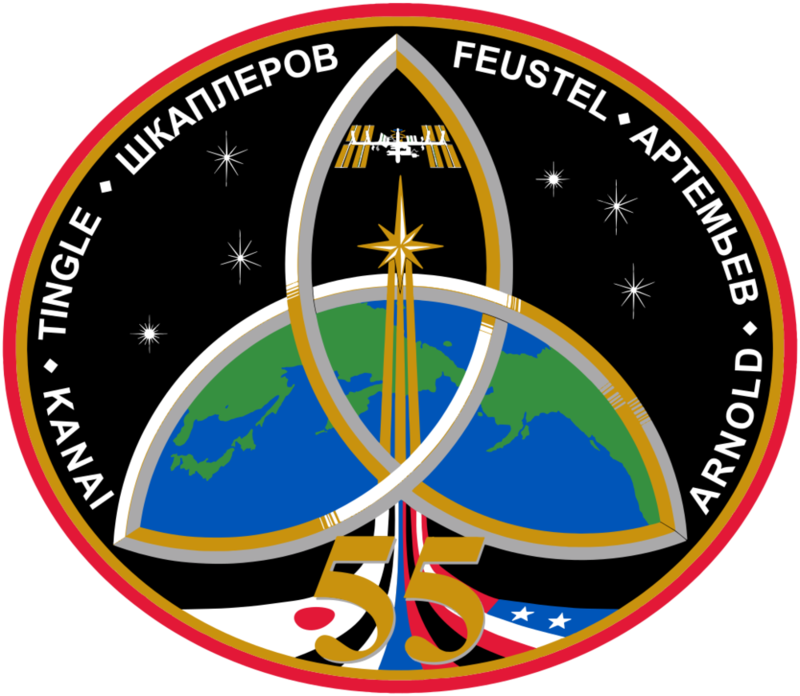 Expedition 55 officially ended at 09:16 UTC June 3, 2018, when Soyuz MS-07 undocked from the outpost's Rassvet module with Russian cosmonaut Anton Shkaplerov of Roscosmos, NASA astronaut Scott Tingle, and Japan Aerospace Exploration Agency astronaut Norishige Kanai. Those three were part of Expedition 54 and Expedition 55 with Shkaplerov serving as commander for the latter. Just over three hours later, the Soyuz MS-07 capsule with its three-person crew landed on the Kazakh Steppe only several hundred kilometers from where they launched in Baikonur Cosmodrome, Kazakhstan. The parachute assisted touchdown occurred at 12:39 UTC. Remaining aboard ISS as part of Expedition 56 were NASA astronauts Drew Feustel and Ricky Arnold and Russian cosmonaut Oleg Artemyev. Two days before undocking, Shkaplerov handed over command of the ISS to Feustel, who would serve as commander for Expedition 56. The "change of command" ceremony started at about 18:25 UTC June 1, and allowed Shkaplerov, as well as his other two fellow Soyuz travelers, to focus solely on returning to Terra firma. When the OA-9 Cygnus spacecraft, named S.S. J.R. Thompson, was within about 10 meters of the football field-sized complex, Expedition 55 Flight Engineer Scott Tingle of NASA used the robotic Canadarm2 to reach out and grab the vehicle. Splashing down just after 3 p.m. EDT (19:00 GMT) May 5, 2018, just off the coast of Baja California in the Pacific Ocean, the capsule completed its second flight into space. Expedition 55 Flight Engineers Drew Feustel and Ricky Arnold of NASA performed the fourth spacewalk of 2018 for the ISS program. Russian cosmonaut Oleg Artemyev and NASA astronauts Drew Feustel and Ricky Arnold docked their Soyuz MS-08 spacecraft at 3:40 p.m. EDT (19:40 GMT) March 23, 2018 while ISS was flying 408 kilometers over Serbia.